The 2 maps are quite nice but the abyss poster is rather cliche. As a PDF download this is a waste of money. Get the paper version. 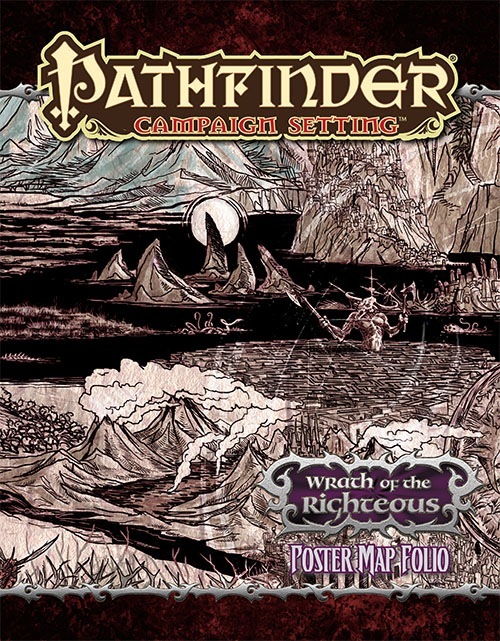 As with most map folios for the adventure paths, the Wrath of the Righteous Poster Map Folio comes with three large, full-colour maps. One is a map of the Worldwound, the area where most of the action of Wrath of the Righteous takes place. The second map is of Kenabres, the city where the adventure path begins in The Worldwound Incursion. Both of these maps are high-quality and beautiful to look at, while also being highly useful for playing the adventure path. Admittedly, the map of Kenabres is really only useful for the first adventure, but the map of the Worldwound will be useful right up to the final instalment. 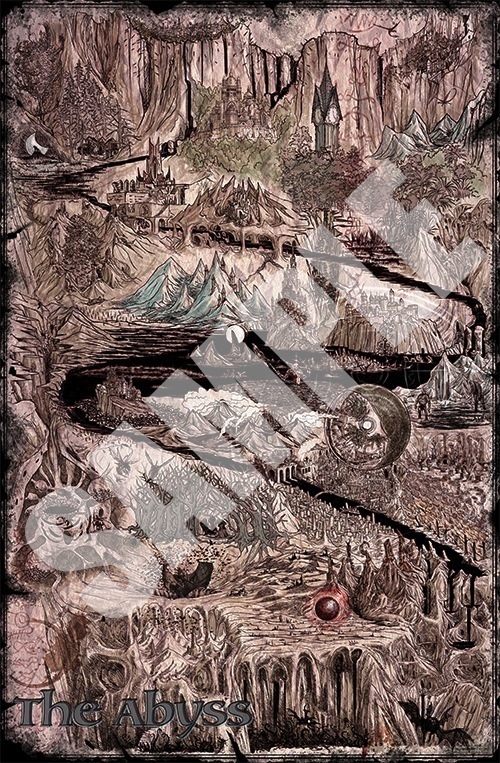 However, the stand-out map of this set is the third one: a map of the Abyss (which the PCs travel to in the fourth and fifth instalments of Wrath of the Righteous). Mapping out the Abyss is a daunting task—no, more an impossible task really, considering the Abyss is essentially an infinite plane made up of countless other planes. What this map does instead is provide an artistic rendition of the various Abyssal realms and “where” (metaphorically speaking) they are in relation to each other. Admittedly, the map doesn’t have a lot of utility in actual game-play. However, I don’t really care. The map is utterly beautiful to behold and can easily serve as an in-game representation of the Abyss—something the players’ characters might actually see. Ultimately, this map provides a visual element to enhance game-play. It gives both players and GMs just a little hint on what their characters are seeing, allowing the imagination to fill in the rest. It also makes a great poster to hang on the wall. Gah! Not until January? Why oh why don't these come out WITH the AP's? That minor complaint asside I am loving the WotR adventures so far. I just started book 1 for a group last week and can't wait until our next session. Unfortunately by the time this comes out my players will have left Kenabres behind... but the map of the Worldwound will be nice. As for the map of the Abyss, looking forward to that! We are getting an In World Map of the Abyss?!?! Amazing....have been loving the In World Maps from Shattered Star onwards....I expect the Cartographer for this one will go all out!!!! Will Kenabres be represented as pre-AP or after the attack in 'The Worldwound Incursion'? Huh, we'll be halfway through by then. The map of the Abyss is gonna blow y'all's minds. Ben Wooten did an amazing job! I don't think I've been excited about the poster maps before, I enjoy using them, but hearing that their is a Player's map similar in style to the Varisian one has me stoked! Hey, I am just wondering why the map folios and pawns, and often the item/face cards for a adventure path always are released after all the AP's? Surely GM's could use those maps right from the first AP!? Not six months later. Art isn't done all at once. It's constantly coming in as they work, they'd have to be pretty far ahead of schedule in order to do it. i have never bought one of the map sets..are there more then one map or is it just one large map.. They contain three poster maps. This one has a map of Kenabres, one of the Worldwound, and one of the Abyss. The city is in ruins at the end of the first module, and is never returned to. It seems to have low utility in general. A map of Drezen would have been really neat, as it would have added to the feel of planning out the attack on the city, as well as a reference point when it's being rebuilt. All that said, a map of the Worldwound should be really cool, and the map of the Abyss sounds amazing! I sure wish you'd done Drezen...maybe even instead of Kenebres. ...and the map's been very useful to us so far as our characters moved through the city and later planned our assault on the garrison. I haven't received mine yet, so it my be premature but I agree that this would have been better. Personally, I'd prefer all of the map folio maps to be "in world". I think they make great handouts - as a "usual" keyed RPGS map, I find the poster size unwieldy. I bought this mainly for the abstract map of the Abyss. While it looks alright I wonder if there is a key out there that tells what each area of it is? Most of the realms I think I can make out, but some of them are hard to distinguish between, like the cities. I'm also curious are all the little dark things at the bottom supposed to be qlippoth as they are supposed to be shoved to the deepest and most remote parts of the Abyss? Oh hey,looks like Sen's Fortress is in the Abyss. That makes a lot of sense. The "map" of the abyss is pretty much an abstract from what I can tell. I'm not sure how it could be done better, as the abyss is pretty abstract. I just feel a more logical location should have been displayed here. Kenabres- I can see why Kenabres was given a map, but why give a version of it from before the AP begins? A map from after the destruction would have much more useful. The maps in our Poster Map Folios are 22 by 34 inches. Could somebody help me naming the 44 areas of the Abyss? I don't have my key with me at the moment, but if memory serves, 21 is Kurnugia and 6 is Basalfeyst. Is there a possibility to post a key here or does one exist somewhere already? 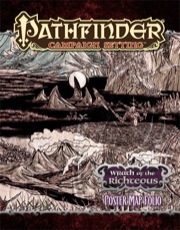 The details on the Abyssal Realms in Book of the Damned II and the Abyss article in Pathfinder #76 give all the clues to sorting out the poster map. I might be inclined to reveal my key, but that's not as satisfying a search, is it? Actually, a map of Kenbres prior to the devastation is much more useful, broadly, than one after. A pre-devastation map has utility for everyone who isn't playing WotR but is using Mendev & the Worldwound.